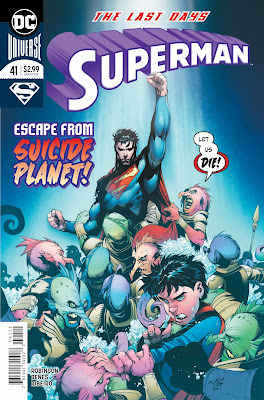 It's time to get all preachy on the planet Galymayne, where Superman and Superboy have come to save its inhabitants before the planet explodes. Too bad that the people here believe that their god demands their death and are willing to fight Superman with their faith magic to make sure they do....... 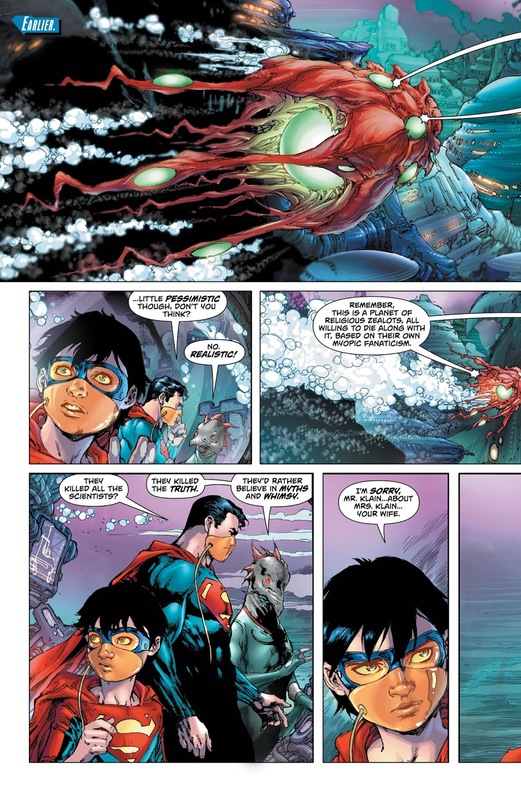 It's also a bit weird that Superman would force his will on them like that, but whatever. 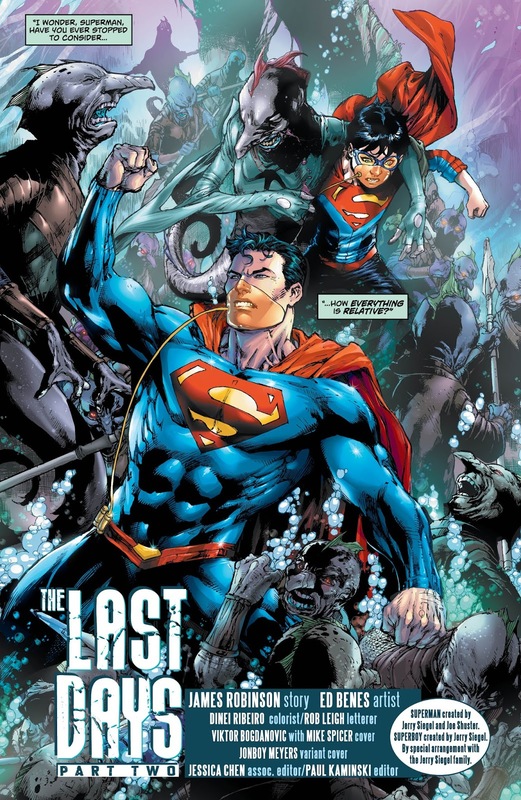 At the end of the previous issue our two heroes had escaped the angry mob with the only scientist of the planet and the trio now make their way to his lab so that they may find a way to continue his species. Let's jump into this issue and see if Robinson goes a little easier on faith in this issue. Let's check it out. 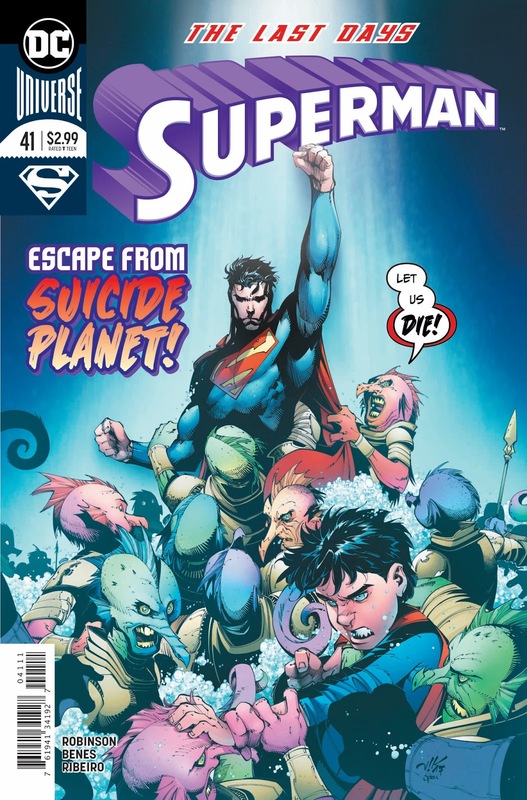 Our issue begins with Superman, Superboy and the scientist, Klain as they enter his lab so that they can determine how to save the people of this planet, but Klain lets our heroes in on the fact that the planet is too close to destruction to come up with a viable plan and he only asks that Superman and Superboy continue his race by making sure that his wife and his eggs are deposited on a suitable planet. Which they agree to of course. Originally though, Klain had planned on going with his offspring, but that plan is quickly destroyed when his lab is attacked by Galymayne's angry denizens, where they break in and destroy Klain's rocket, not to mention kill Klain himself. 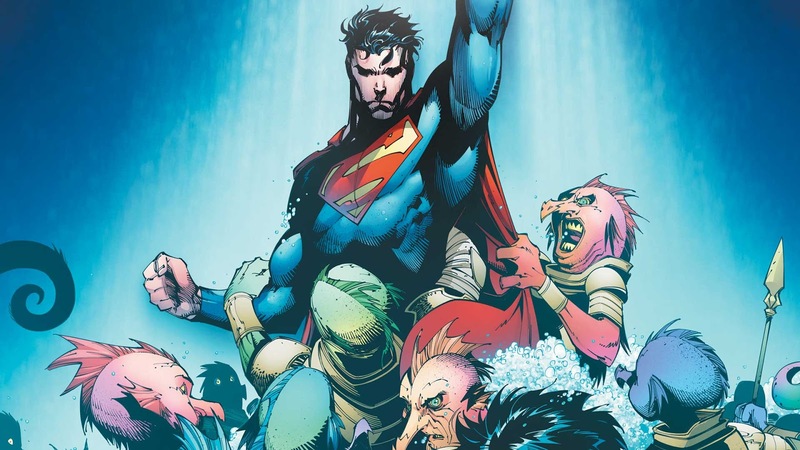 Thankfully though............ for some reason, Superman's powers return to him because I guess these people aren't praying as hard as they were before and he's able to easily fight them off. In the end, Superman has Superboy take Klain's eggs and leave the planet, while Superman talks to the high priestess one final time, hoping to convince her to let him save her people. No dice. The planet explodes and our heroes are left feeling bad about not being able to help, but that doesn't mean that they'll ever stop hoping to change the hearts of others in the future. That's it for this issue of Superman and it doesn't seem like there was a whole lot of story left to this second part because goddamn did it go on and on to catch everyone up and even repeated a whole bunch of things throughout the issue. This is a strange issue to review because of the mixed feelings that I got from this story and not feelings about the book, but what it made me feel about our Man of Steel. 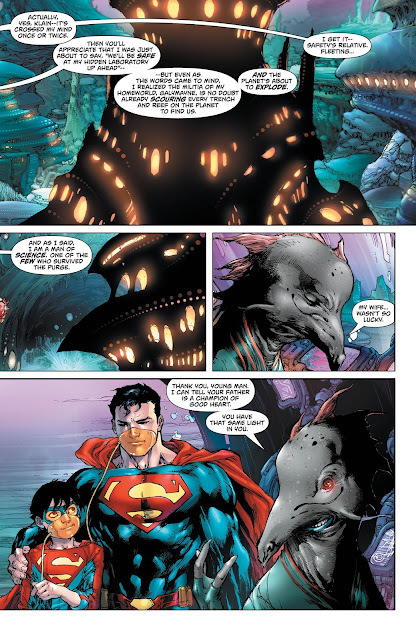 The idea of religion thrown in feels odd in a Superman title, especially when it seems that our hero is so willing to force his will on others regardless of their beliefs. Thankfully, most of that was put to rest here, but by the end of the issue there wasn't much to this story. Even though I'm a bit mixed on what went down in this issue, I wasn't mixed about how much I loved the art here and thought that everything here looked fantastic. It seems like most of the anti-religious stuff that was rampant in the first part of this story is put to bed here, where the focus turns to hope and thankfully, hope is something that I can deal with. Even with that though, there wasn't much of a story here in the end and the only real saving grace to this issue is the incredible art. Eric Shea hates kids and apparently religion too. This issue does a great job of setting Superman up for his eventual meeting with... a naked blue man that some consider a god.